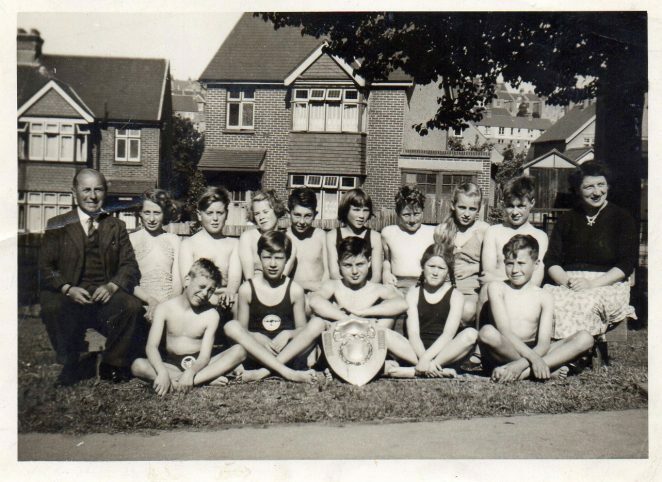 I have just come across this photograph among my possessions, which was taken in front of Hertford Road School and celebrates our school team winning the Brighton Swimming Gala in 1956. I’m Robert Niblett and I am sitting directly behind the trophy. Hopefully, other young swimmers are able to recognise themselves or someone will see it and perhaps throw a bit of light on what was clearly a memorable day in the School’s history. If you can help, please post a comment below. Click on the image to open a larger version in a new window. Yes I remember you Robert; my name at the time was Jennifer James. , and I was quite good at swimming although I’m not in the photo, so I couldn’t have been good enough for the team at the time, nor do I remember them winning a swimming gala. I remember your parents had a shop in Barnett Road and you were a good singer, singing the part of one of the three kings in the carol service. I was Angel Gabriel in the Nativity play. I don’t recognise anyone else in the photo, other than Mr Hickman and Miss Tugwell. My best friend at the time was Christine Marchant; do you remember her? I went on to Varndean and think you did too, along with Robin Hemsley and Terry Porter. The girl with the long hair on one side of you Robert is, I think, Jean Eastwood, and on the other side I think it’s Vivien Broomfield. Behind you and Vivien Broomfield is, I think, Reggie Winter, although I can’t be sure of any of them. If so, this must have been the year before we left Hertford Road, as Jean and Vivien were a year older than us, although we were in Mr Hickman’s class with them for one year before they left. For some reason which I cannot now recall, some of us were in Mr Hickman’s class for two years. I also remember that those of us who were keen swimmers went to a swimming club at St Luke’s (top of Elm Grove) on a Friday evening. I still don’t remember winning a trophy though, although I do remember the football team, captained by David Dyson (known as Chubby) winning a trophy, and have seen a picture of that too on this website. It’s good to hear from you Jennifer, I certainly remember you and also Christine Marchant who was a very early friend when I started at Hertford Road School aged 5. The swimming club at St Luke’s baths on a Friday night brings back memories of a group of very keen swimmers who in summer couldn’t keep out of the water, although I mainly use the scene these days to recall that the 9d given to me by my parents would pay for my bus fare, entrance to the club, a 4d bag of chips and a 1d iced lolly as we walked home. My children look suitably bored if I mention this.I think you’re right about the year, it would have been a year earlier than I thought and is almost certainly 1955. It explains the fact that I don’t remember being in the same class as many of them pictured, none of them has yet responded to my message and you can’t remember our heroic victory so perhaps the whole thing was a hoax and questions should be asked! It does look a very impressive trophy though and me sitting in the middle looking suitably invincible! I live up the road from Hertford Road and wondered if they had a swimming pool there and if it’s still there? It looks like a smashing summery picture and took me back Tommy school days and the 20ft rigid pool we had which we had swimming lessons in! I can still remember the joy on a hot summers day and 8th cool pool! I pass the school now and again, and when I look at the school, I ALWAYS remember that pool and summers! The pool went soon after I left school at 16, which I thought was a shame as it gave us good memories! There’s a building where the pool stood! Such a shame! A junior school and with a pool! In summer! Heaven!